Hi all, im a first time builder from Aus seeking some advice. After a spur of the moment start following some advice on you tube i built the reactor, i have since built more peices and am ready to weld them together. My issue is i am now worried my design may not work and i cant really test it without welding it together. Any help would be greatly appreciated. Welcome Jamie. Good start in the gasifying business. This might just work, at least for a while. Did you raise the reduction tube up a little into the fire tube to act as a stopper for the ash insulation “cone” at the bottom of the reduction tube? Ash insulation is important there to keep those metal melting temps from destroying the vessel. Will the 3/4" nozzle pipe be centered in the reduction tube 4 inches above the restriction? and will the hopper be air tight? I would say weld her up and try it out. That is the fun of this I think. Edit. Fuel size experimenting will be an important thing to do. If one size gives trouble another size might be perfect. Before you do any cutting you may try put in a small slice from a pipe with a flange on it to support the ash cone. This will act as a restriction at the same time. Hard to tell how this design will work. 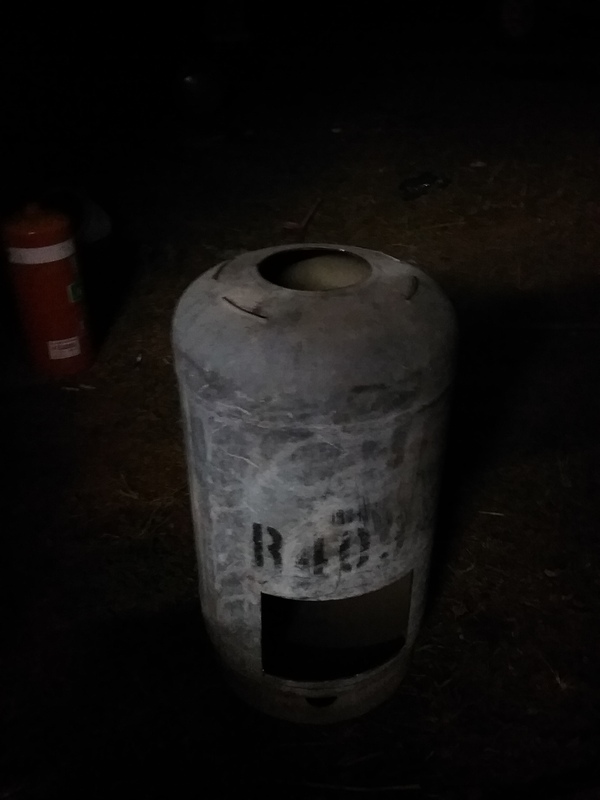 I guess not many people here have ever tried a wood gasifier this small. Very important though to try keep the reduction hot in some way or another. Ideally the whole reduction tube should protrude into the above ash cone for insulation. Hi Jan-Ola, thankyou for the reply. How far should the reduction tube protrude into the ash cone? Do you think i should make the reactor bigger? 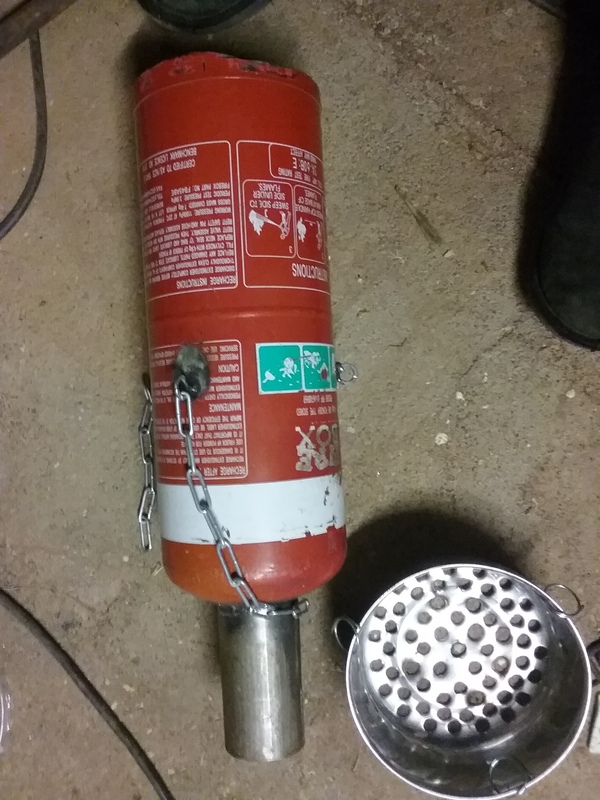 I have a bigger extinguisher i think its 8inch diameter. If so how long and what diameter should the reduction tube be? I thought from the information i found on the internet that a reactor this size was right for an 8 or so horespower motor? Cheers! Very hard to tell dimentions with this size and type of gasifer. I´m actually just guessing here. Anyway, I would let all of the reduction tube protrude for insulation purpose and use at least a 3 in tube. Maybe make it a little shorter, 3-4 in, and then put a restriction, that can be changed out, on top. Start with a small one. No signs of tar and you can increase the diameter if needed. Just for reference I use an 8 in firetube and a 6 in reduction about 4 in tall with a 3.5 restriction on top. I guess I culd satisfy engines in the 15-60 hp range. My 1.8L 95 hp engine runs ok too but the gasifier doesn´t like me going WOT for any longer period of time. I would suggest charcoal for that small of an engine. Just because of the tar factor and low cost to get started. It should get you up and running with success faster. I have seen people do it with wood. However one of the issues is there isn’t constant airflow with a single cylinder engine which can lead to tars. so it is a bit trickier to do. Hi Jamie, I would have to agree about the charcoal generator. Much easier and lighter too. From my exp. dried wood chips make great fuel grade charcoal. No grinding needed, just screen at 1/8 inch. Nozzle size and position are important. Still using the same nozzle for 6 moths at least 2-4 hours a day. 3-4 days a week. No melted nozzles no slag problems. Slag is always off to one side at clean out. I really don’t care just call me in time to cook supper can’t beat burnt chicken when it’s scorched over a roaring charcoal flare!!! Hahahahaha!!! Been there man it tasted good!!! Hello and welcome Jamie Keatley. A member here: Dutch John, did make up very small mobile wood gasifers IC engine fueling systems. One for his down to 2 hp lawn mower. Hard to exceed his proven results and experienced based learned wisdom. Ha! My bbq’ing wife steals all actual wood charcoal I’ve ever made up. And only the limb-ring knot sections on 75 year+ conifer trees like my Doug Fir can make a hand-able/storable wood charcoal chunk! Only wood chunks safe from her bbq-loving hands. Welcome aboard Jamie plenty of small engine charcoal users here all willing to help out with idea’s ect if needed . Hi Jamey, Welcome to the best information center on woodgas on the web. After you log onto the DOW page, click Forum. On the upper left side of that page you will see an All categories box. Click on that box and the All categories menu will show a bunch of colored squares. These are all the different categories. The first brown box is the Small engine category . You’ll probably find what you’re looking for there. I think these boxes used to show the category title when you put the cursor on it. Now you have to open the box to see what the category is. A bug happened. Will look at it shortly. EDIT: fixed, sorta. Thanks for the info guys, i am having a crack at the simple fire. I will post some pics and no doubt more questions as i go…Thanks again, cheers! (forgot to charge my battery pack so had to use my bucket vac on low.) After that I did flare for few minits with water. Hard to get the drip count low enough with a 3/8 ball valve, but after a little bit I think I have it figured out. My char gasser is two five gallon buckets stacked one on top of the other. I use black iron pipes so I don’t have to worry about the heat melting hoses. every so often I pressurise the system to check for air leaks. Alas my bottom bucket has a leak in the bottom. So I guess it’s time to build a new one. to help insulate them,plus when I run the gasser right down to nothing. That’s about what will be left: nothing but about 4 inches of char above the nozzles. without damage to the nozzle. This page is set up for veiwing only. is the job that never get finished.